So although I suppose I’d enjoy a ‘Walkabout thru thee Principality (Monte Carlo) during the Grand Prix weekend, instead I had the good fortune of spending Memorial Day weekend once again at Mother Speedway! As I think its safe to say my Rookie stripes are off now, since this would be my fourth I500 outing, of which I’m circuitously making my way round Indianapolis Motor Speedway by having now sat in my fourth different locale this May, from the dizzying heights of entrance into the IMS Media Centre’s lair as the first wave of bloggers. To the Front Straightaway, Turn-2 and now Turn-4, as I really hope we’ll skip turn-3. Thus, it seemed a tad bit funny that the day prior to leaving it was a balmy 46 degrees-f and RAINING in Seattle when I went to go purchase some sun tan lotion for Indianapolis, albeit I was hoping that the pre-race forecasts were correct, having seen very comfortable temperatures ranging between 64-70deg-f on Raceday? Although apparently another “record” crowd of 75,000 attended Carb Day, I found it to be relatively relaxed and not overly crowded for the most part, ignoring the multiple people bouncing off of Mwah whilst standing along the front straight’s Pitlane during the Pit Stop contest. And little did I know that I’d get the privilege of “Meeting ‘N Greeting” four of the 2013 field’s competing drivers, getting to shake hands and ‘Talk Smart with ‘FAST EDDIE, aka Ed Carpenter, this year’s Pole winner. Next up was the ultra enjoyable Mayor ‘O Hinchtown, or simply ‘Hinch, nee James Hinchcliffe - who was ultra kOOL! Then it was a somewhat weary RHR (Ryan Hunter-Reay) and finally a very pleasant chat with Ryan Briscoe before the weekend’s piece de la resistance... Ready? Drumroll please; Tuh Duh! 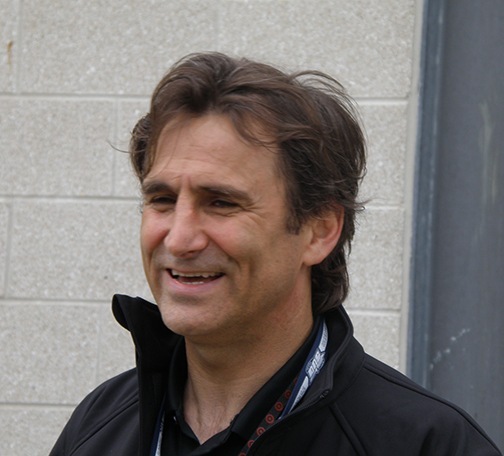 I got to meet the ‘legendous el Zorro, nee Alex Zanardi; aye Karumba! All of which was sandwiched in-between a very AWESOME finish to this year’s Indy Lights Freedom 100, with an unheard of four-wide photo finish on the final lap! On Saturday, the Five Amigos went back to Mother Speedway and while the three Hosers spent copious amounts of time pursuing the day’s cache of coveted racing memorabilia, Dave once again graciously guided me thru the Legends Day’s second session - where I chose Line B strictly to get the esteemed ‘King Hiro’s “John Hancock,” as I’d seen Hiro Matsushita in action several times at Portland Int’l Raceway, along at Vancouver BC’s Molson Indy and even have his 1/64 Hot Wheels IndyCar buried in one of my numerous boxes - having chosen Hiro over the more sought after Mario Andretti in Line A, since I’d already gotten his autograph the year before. And the race was GURR-REAT!!! And seemingly went down in a virtual blink of an eye due to the record setting 133-laps of Green Flag running which in turn led to establishing the new fastest race, breaking the 1990 record. And fortunately Simon read to me both Saturday’s qualifying and Sunday’s race reports from the Monaco Grand Prix which previously I’ve hushed them from telling me anything... Which I suppose was an omen of what I’d discover upon returning home that I’d put the ‘Telie on the WRONG channel and thus recorded 3.5hrs of blather on duh “Peacock-lite,” nee NBC Sports Network instead of aligning the TV channel on NBC, who’s showing four events on the Big Brother channel this year; FRICK! And I won’t even belabor Y’all with my travails of getting stranded in Chicago’s O’Hare International Airport for some 7.5hrs; SHEISA! In order to return to a gray, cloudy, and humid Seattle, as I walked to the grocery store for some much needed supplies Wednesday afternoon and could actually feel the moisture in the air landing upon my woolen stocking cap along with gortex raincoat just in case, eh? Even needing to readjust the heaters to the on position upon returning from Indianapolis, before spending the entire day whilst typing this on my keyboard to the sounds of multiple weed wackers, bush cutters, dump trucks and the steam cleaning van all noisily working away outside my Apartment complex; ACK! As the joyous sounds of 33-racecars circulating continuously around Mother Speedway have been replaced with the grating sounds of shrubbery maintenance which has given way to the requisite dull thumping of some Yeahoo’s car stereo system - all of which is making me yearn for some piece ‘N quiet instead of the droning of Suburbia, as hey after all, I suppose there’s a reason they made that classic movie Sleepless in Seattle, right?